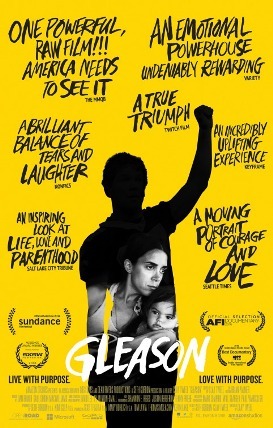 Open Road Films releases Gleason on July 29th, 2016 at Landmark Sunshine Cinema and AMC/Loews Lincoln Square . NYC MOVIE GURU: When it comes to finding the right balance between entertaining the audience, provoking them emotionally as well as intellectually, which of those elements it the most challenging to calibrate? Clay Tweel: Emotionally. One of the terms of phrases that one of our producers, Seth Gordon, came up with early on is "empathy exhaustion." I feel like that that was hard to go against when putting the film together. We didn't want people to be all cried out an hour into the film, and then just become numb to experiencing the rest of the movie. So, being able to find the humor and mirroring the experience of being with Steve and Michelle who are fun-loving people even when they're going through difficult times. Understanding and trying to build into the story of what we see as true to these characters, the light-heartedness and love of life, mixed with the tragedy of their situation and trying to find that balance---that emotional ping-pong was one of the harder things. NYC MOVIE GURU: What was the process like to decide what kind of audience to make Gleason for? CT: By pleasing everyone, you end up pleasing no one. I think that the movie is pretty dense. There's a lot of complex emotions that go into what Steve and Michelle have gone through. That complexity lends itself to a certain amount of subjectivity, so people are taking away different things from the movie that perhaps weren't even my original intention. I like that. I think that there's a level of nuance to the film that I hope people appreciate. In terms of pin-pointing the audience, it's a movie about love and family, and I think we all come from that, so those themes are very broad, so it's hard for me to put my finger on which audience it's for. I don't have that answer, really. NYC MOVIE GURU: Gleason is both specific and universal when it comes to its story. Why can something be universal and specific at the same time? CT: The more specific that you can get, it leads to universality. So, if you can really get to the specifics of why people are doing what they're doing, then you're going to get into more abstract ideas. By learning the motivations, you're going to understand somewhat of the psychology of how they're experiencing the world, and I think that that's going to start broadening out. I try to do that with a lot of the films that I create. Teenage magicians is a very niche audience, but everyone has experienced the idea of trying to find themselves and to figure out who they are in their teenage years. A movie about 3D printing is also a very niche class of technology, but everyone at some point as trying to succeed or be a part of the American dream in some ways, so that's broad. That applies to Gleason, too. NYC MOVIE GURU: Which is more challenging: to squeeze seriousness out of comedy like in your previous film, Finders Keepers, or to squeeze comedy out of seriousness like in Gleason? CT: Comedy out of the seriousness. Trying to not feel like that there's a forced inspirational message or a saccharine cheesiness to a story is more challenging than comedy which often comes from a dark place anyway. I'm very proud of the balance struck in Finding Keepers as well, but with this, it's the flipside of that coin. In order to create that was a little bit harder to pull off. NYC MOVIE GURU: I believe that humanism is a truly special effect in cinema. Do you agree or disagree? CT: I agree with that. Trying to get people to experience somebody else's story and understand them and relate to them is certainly a challenge. Perhaps it's a little bit easier in documentaries than in fiction because there's less suspense of disbelief. It's all about expressing, as authentically as possible, who these people are. Sometimes expressing somebody authentically can be showing their silly or goofy side. Shannon Whisnant [in Finder's Keepers] is a big, boisterous character. Our hope is that you'll laugh with him and not at him. Laughing with him, you're experiencing who he is: he loves to make people laugh. I think for this movie, Steve and Michelle, Michelle is takes care of people, but she also has a razor sharp wit and turns out to be a joker as well. So, we wanted to take you on the roller coaster of emotions that she's going through constantly. In that way, you see what the type of human being she is. NYC MOVIE GURU: What do you think is the purpose of suffering in one's life? Would you like to live a life without suffering? CT: The Buddhists say that "life is suffering." Steve has a saying that he loves to say which is that "through adversity, we find our heroes." I subscribe to that as well. You might not find heroes, but you'll find ideas and parts of yourself. Maybe you're the hero. So, I think that struggle is just a part of the universe. If everything was rosy, I don't know if there would be any human experience. It reminds me of The Matrix when the agent is talking to Morpheus and he's like "We tried to hook you up and put you into this perfect world, and you rejected it!"